Swiss-Garden Residences offers 4-star apartments with spacious layouts and modern interiors. An outdoor infinity pool and fitness facilities are available, as well as a sauna and racquetball courts. 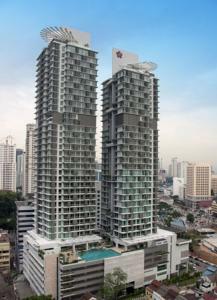 Occupying a central location, Swiss-Garden Residences Kuala Lumpur has direct access to Swiss-Garden Hotel via a link bridge. It offers free shuttle services to Kuala Lumpur city center, Chinatown and Bintang Walk. Modern apartments feature high ceilings and comfortable lounge areas with a flat-screen TV and sofa set. They have a well-furnished kitchenette and dining area. Each has an iPod dock. Guests can relax with a massage. Other leisure amenities include a playground, game room and barbecue facilities. Feast on a buffet spread at Flavors Restaurant or have a healthy treat at Green Treats Delicatessen, which offers freshly baked organic breads, wholesome sandwiches, selection of noodles, cake, gourmet teas and coffees. Free internet access is available in all restaurants and bars. Wired internet is available in the hotel rooms and costs MYR 10 per 24 hours. Wi-Fi is available in the hotel rooms and costs MYR 10 per 24 hours. Free! All children under 12 years stay free of charge when using existing beds. Free! One child under 2 years stays free of charge in a baby beds. One older child or adult is charged MYR 98 per person per night in an extra bed. The maximum number of extra beds/baby beds in a room is 1. Any type of extra bed or crib is upon request and needs to be confirmed by management. Supplements are not calculated automatically in the total costs and will have to be paid for separately when checking out.